Welcome to my website, which is filled with a wealth of resources, research, valuable information and experienced advice, from an industry veteran to guide you through the maze of hair loss. My website will enable you to get educated swiftly and safely, enabling you to make the most appropriate and informed decision for YOU. My name is Spencer or “Spex”, as I’m known within the global online forum community. Over the last 10 years, I’ve supported thousands of hair loss sufferers with their individual concerns and anxieties whilst advising them on what can effectively help beat the curse of hair loss and how to best restore lost hair via hair restoration correctly. Be warned, the hair loss industry preys on your vulnerability and isolation. I fell prey to the hands of this brutal place and my own journey was unfortunately very long, emotional and tremendously tiresome. My sole intention and purpose is to educate and inform you of what is actually available now to you, whilst keeping you safe and support you to take action in the most appropriate way for you. 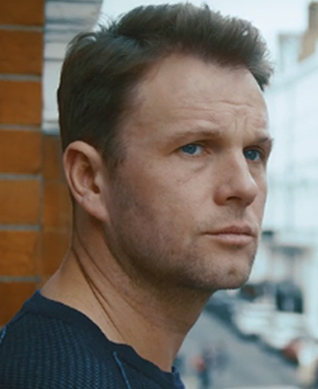 If you are considering treating your hair loss via medication or hair restoration surgery, you will most certainly find the most effective proven methods to facilitate your goals of minimising your hair loss and maximising potential hair growth here. The first thing you should consider doing is downloading my FREE report ‘The Follicular Fight’. Simply enter your name and email on the right hand side and you will receive my helpful report straight away. I’m “Spex” and I have been a long standing mentor within our hair loss community for over 10 years. I have been on one hell of a journey with hair loss and hair transplants, an agonising journey I want to make sure you avoid. I have built an unrivalled reputation within this particular industry for honesty, integrity and telling people how it is. Telling them what they NEED to hear, not what they want to hear. 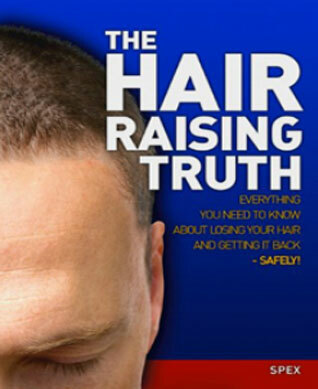 I have put together this website to provide you insight into accurate and honest information I’ve personally gathered along my ten year investigation and fight with hair loss. My intention is to pass on vital knowledge to facilitate your personal journey, as I have accumulated phenomenal insight over the past decade through my own journey and attempts with numerous products, treatments and eight hair transplant surgeries. Over the years it’s become my plight to prevent others making the same mistakes I did. I have interacted with and helped countless hair loss sufferers and can help guide you too. The aim of this site is to empower you and keep you safe as you need accurate information when it comes to hair loss within this dreaded hair loss industry. The sharks, con men, snake oil sales websites will all attempt to prey on your vulnerability; in order to tell you exactly what you want to hear. As they want you to buy their products rather than help you to actually fight this dreaded hair loss trait via appropriate proven treatments. I am here to inform you of what you need to hear. I want you to learn from my mistakes and enable you to gain insight and knowledge quickly and accurately so you can make an informed decision as to what is potentially the right course of action for you, whatever that may be. Hair loss can be incredibly emotional as it isolates you and makes you go deep within yourself. You feel alienated from your friends and family as you feel violated and isolated, unable to openly discuss what’s happening to you. Suddenly your trapped in your own hidden world…trust me, I know! Even though I have met and interacted with 10,000s of hair loss suffers over a 10 year period, outside the world of hair loss, up until only very recently, only my wife mother and sister knew I had any issue with my hair. I have kept it a secret, a very close one. I understand how you feel! It was only recently I decided to tell my story very publically in order to help educate as many people as possible with the facts. I felt it important given the misinformation still out there today! What you are feeling about your hair loss is very normal. It doesn’t matter what stage of hair loss you are at, it’s all relative to you and can make you feel very anxious, downtrodden and alone. The mix of emotions is a process and one I can help you understand and get past smoothly. I can help you avoid all the contradicting overwhelming hype and put you in direct touch with the FACTS. You feel a loss of identity and self-image when you start to realize your losing your hair and it truly can be devastating. Your loss in confidence and self-esteem are something that you feel truly confused and anxious about. And the lack of control surrounding your hair loss only amplifies your fear. You don’t know where to turn or what to do! My experiences and knowledge can help guide you, so don’t panic. Take time to digest this information, as it will enable you to not only gain insight but also enable you to understand what you are dealing with and give you perspective. I can guide you to a great deal of accurate information, to arm you and empower you so that you can make an informed decision with what’s potentially right for you. The industry preys on the vulnerable, it did me. 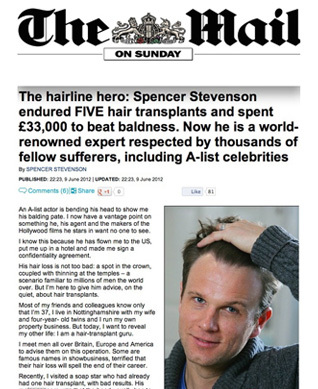 I spent in the region of £40,000K in pursue of my hair over a 10 year period and finally succeeded. I can save you the long agonizing vulnerable journey I had to endure, whilst at the same time saving you time, effort, energy and a great deal of money. I can guide you to legitimate appropriate treatments that are established and proven and I myself use still today to help maintain my situation. Hair loss is something that I know only too well just how devastating, depressing and traumatic it can be. It was the bane of my life for several years. It consumed me and it became a real issue for me mentally as well as physically. I want to prevent you having to go through this torture by getting you informed promptly with accurate information. Spexhair.com is my personal journey of restoring my hair successfully. It is a combination of over 10 years of mediations and treatments and also several transplants, both disappointing and successful repair procedures. My website is here to support and empower you and prevent you from making the countless mistakes I made.